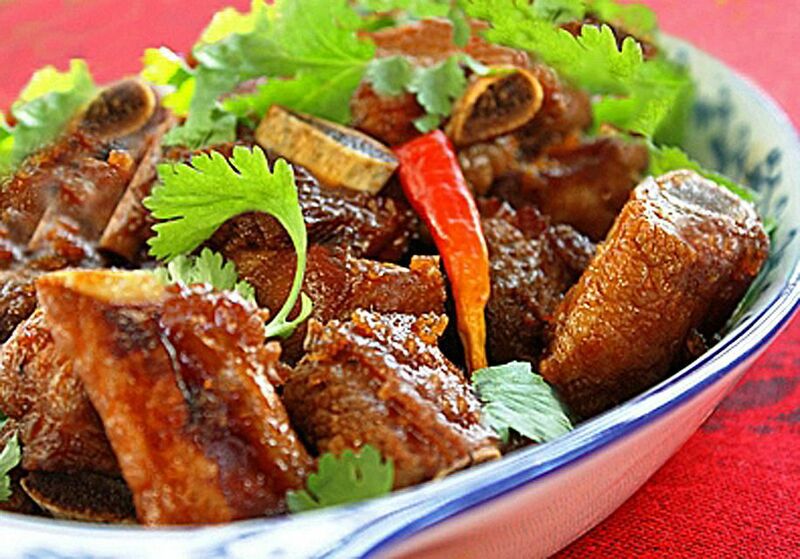 This Thai ribs recipe creates ribs that are sticky-tangy good! Great for dinner or as a finger food. They're easily made in your oven, and there's no messy parboiling involved - just stir together the marinade with the ribs and let them bake slow and long (the secret to tender ribs!). While they're baking, stir up my special Thai sauce, which makes these ribs taste simply divine. Great for everyday eating, and also terrific for a party where they'll be devoured in no time. Enjoy! Chop up the ribs, being sure to leave on the fat (helps flavor the dish). Pack ribs into a 9 x 13 baking dish or pan. Combine marinade ingredients, stirring to dissolve sugar, and pour over the ribs. Turn to saturate all sides. Marinate at least 10 minutes while you warm up the oven (or up to 24 hours in the refrigerator, covered). Preheat oven to 325 degrees. The marinade should be 1/4 to 1/2 inch deep around the ribs. (If your baking pan is larger, you may need to add up to 1/4 cup water to achieve this.) Cover with lid or foil and bake 1 hour. Remove from oven. There should be at least 1/2 inch of sauce in the pan. While you have the dish out, turn over any ribs that look dry, ensuring most of the meaty parts are covered with sauce. Cover and return to oven for 1 more hour. While ribs are baking, combine Thai Sauce ingredients together in a saucepan. Bring to a boil over high heat, then reduce to medium (it will smell rather pungent as the vinegar burns off). Boil 10-12 minutes, or until sauce has been reduced by 1/3 and has thickened. Remove from heat and add 1/2 Tbsp. lime juice. Once it has cooled, do a taste-test: it should be tangy, with strong sweet, sour, and spicy tones, plus a little salty. Adjust the flavors by adding more sugar if you find it too sour, more cayenne if you'd like it spicier, or more fish sauce if you'd like it saltier. Add more lime juice if too sweet or salty. Note that it will taste strong now, but will be delicious when combined with the ribs. When ribs are cooked to your liking, transfer to a serving bowl or platter (bring some of the marinade with them). Now drizzle over the tangy Thai sauce and top with the green onion and coriander. Serve with jasmine rice and enjoy! The secret to tender ribs is to bake them long and slow. The longer you bake them, the more tender they become (there's no need to parboil them first). If you like your ribs lightly browned (e.g. BBQ-ed), after ribs have finished baking, transfer them to a foil-lined pan and pour over half the Thai sauce. Set under the broiler for 5-6 minutes. When lightly browned, serve up the ribs with the rest of the sauce poured over. Top with the green onion and enjoy! Try the Most Popular Salad in Thailand: Som Tam!